Celebrities hunt for antiques across the UK. Two titans of British acting hit the road today as Game of Thrones star Clive Russell takes on Auf Wiedersehen, Pet star Tim Healy. Browse content similar to Clive Russell and Tim Healy. Check below for episodes and series from the same categories and more! -I've got some proper bling here. Pick your legs up, girls! But it's no easy ride. Who will find a hidden gem? Put on my antiques head on. Clive Russell and Tim Healy - are braving the elements. It's getting quite spooky, isn't it? It's almost misty. Good weather for a horror movie. It's not normally like this, the road trip, is it? They are usually in summer frocks and shorts. Tim and Clive first met on the set of British sitcom Heartburn Hotel. I think it was 1999. We did two series and we did a Christmas special. -Are you into antiques, are you? -It fascinates me in a way. -There's a clutch on the left-hand side. CHUCKLING: Yeah. Remember, it's a left-hand drive, Clive. They are burning rubber and gears in a 1964 Mustang. Oh, yeah. which is why our celebs aren't wearing any. Tim shot to fame in the '80s hit Auf Wiedersehen, Pet. He worked with Clive again when the series returned in the noughties. in international phenomenon Game Of Thrones. national favourites like Corrie, and cult drama Ripper Street. Armed with £400 each, they are going head-to-head. But after 16 years of friendship, I wonder how competitive they are. -Are you a good haggler? -I am used to haggling a bit when I'm abroad. -I've just come back from Spain, from Benidorm. You know, you never pay the price they ask for. -as long as it's me. -As long as it's me, pal. I'm a little bit nervous about your international experience. David Harper and Margie Cooper. We've only worked once together. Why do I sense I've worked with you for 48 years? -Because I talk a lot. I pack a lot in. -Who is winning so far then? -So you need to get me on this trip. Oh, I will. I will, definitely. This is going to be one competitive Road Trip. and very much looking forward to meeting their celebs. -So, we've got two pretty cool characters today. They seem to know each other well, don't they? Auf Wiedersehen, Pet, which I remember really well with Tim. -I loved that series. Never missed it. I can't resist a Geordie. ..ending up at an auction in Leith, in Edinburgh. Our journey starts by the beautiful walled city of Berwick-upon-Tweed. -Oh, it's a Mustang not going very quickly. Margie, you are dripping all over me. Go and get your Geordie fellow. Go on. Off you go. Clive, come under my umbrella. Good to meet you too. Can we go somewhere warm? and dry shop called Auction House Berwick. Are you into any antiques in any way? -Well, my lady, Jo, actually, she's the antique fanatic. -She collects these little pigs. -Yeah, got hundreds of them. -Let's see if we can find one. Will they find what they are looking for? -What? That's a nice-looking box. Right. Lovely mahogany box. Beautifully made. Look at that. -Some kind of early printing press. What do you think, made in '30s? -No, it's earlier than that. -I reckon that's tipping into late Victorian, Edwardian. Well, look, shall we just get it... Let's tuck it away. -We are in the shop with those two. -So let's tuck it away. That's one possible purchase squirreled away. How are Clive and David getting on? Do you have any interests in antiques? -I think on the broader side, it's really fascinating. The history of objects and what they represent and stuff like that. As far as being in any way knowledgeable, no. Not to worry, Clive. Our David loves a challenge. -when it comes to things that we like. So, I'm stood next to this sofa. I absolutely love it, for a number of reasons. But what do you think? -It's a delicate, feminine sofa, I'd say. I like to go to sleep on a sofa. I think that means he likes it. -..you could sleep on this. Let me show you. ..is a double-armed drop-arm sofa. You could recumbent on that. -I'm now going to lie on this. -One moment, please. I'll do it this way. So you've got the pillow ready. -Oh, my God, that fantastic. Just a bit taller than David, then. is a really good feature. -I'm assuming it's a Victorian, Edwardian. Bang on. Yeah, I think safe to say described as Edwardian. A sofa of this quality nowadays could cost you thousands of pounds. Yeah, I think... I think we should go for this. Time to call on dealer Steve. -You look so good with what you are wearing. and he would be happy with somewhere around the £200 mark. Yeah, it's going to kill us, Clive. It needs to be 50 quid and I don't want to be cruel. No, no, no, I fully understand. It needs to be that for us to get it into sale. I'll see the best I can do. I mean, you said £50. You haven't moved upwards yet. 50 to 70, tell him that sort of range. And it's a sale today. It might go... In auction, you might not get a bid on it. David's taken the lead on this one, so it is now a waiting game. Back with their rivals, Margie is onto something. -That is a coronation chair. -The coronation chair, it's in Westminster Abbey. Oh, look, if it were silver, they fetch about 100, 120 quid. Which is why its ticket price is just £10. But what about the box Margie's secreted away? Busy man today, Steve. We're just thinking, but we haven't decided about that box down there. The one with the printing thing, bit of a useless thing, actually. -Awful. Nobody's going to want it. -Is that you trying to get a discount? SHE LAUGHS Oh, yes. Stand by. -It's a lot of money, isn't it? -What are you looking at me for? Is the notorious Haggler Healy about to reveal himself? -You can't manage 14 quid? Anything you see in Benidorm, you say, "How much is that?" Certainly a tactic you could try. -Are you sure you want it? -Yeah, I'll have it for 16. -That's one thing we've got. That's good Right. So, that's one in the old bag. Ooh, look out. Margie's on the warpath. We're not going to bother about that. Right? I feel like a naughty schoolboy. Maverick Margie is leading Tim astray here. -That's Denise, my ex-wife, yes. And one of her scripts. when an ex-wife is going to pop up in a basement. Ha! It's nice to see the old face. -You'll get into trouble for that! -I don't mean the 'old' face. Clive and David are on the move again. -"Come on, let's go have a picnic on the beach." -take you back in time, what, 50 years to when you were a kid? I think it's got you, hasn't it? -It's grabbed you, this thing, hasn't it? Clive's found another item he loves. Now all he needs to find is Steve. What on earth has happened to you? The face of a grandfather clock has just knocked me on the nose. Oh. Well, see, the dangers of the antiques business. But I've been the auctioneer, I'm still standing here. Well, we want to talk about this thing. -But first of all, let's cover the sofa. -Would you do it at 80? -Sorry, I didn't consult you there. -You've done it. You've done it. That's fine. Clive is quick to take control, but perhaps a bit quick to say yes. Let's see if you can improve on the picnic hamper. How much is it? I would be looking for about £40, £50. -That's a little bit scrubby, isn't it? -It is. It needs a wiping. This damage. Down there, a little bit down there. -I can't see it down there. -You don't hang about, you, Clive, do you? Mr Nice Guy has gone. So, can you come down to something like 25 for that? £25... There's a missing thermos. -Yeah, I think that's reasonable. -Have you done another deal, have you? Yeah. It's the Clive show. Well, that's two things I really like we've got. That's terrific. They are on a roll with two items in the bag for a grand total of £105. Tim and Margie are still out of bounds, though. Any bargains in the basement? Well, there's no silver mark but it feels like silver to me. -We're going to be in Edinburgh, of course. -So it may be quite popular, might it? -Yeah, it's got... It looks like silver. -There's no marks telling us it is. Time to call on Steve again. I'm a bit worried that there's no silver mark, Steve. Do you know if this...? The owner is looking for around £100 for the two brooches. I was thinking 25 each. Would be about right, wouldn't it? Look out, Haggler Healy is back in action! 30 quid, then. There, we've gone up by five. Well, look, they should be £100. -You're still in with a good shout there. -..that was like a money box. £80 and I'll throw the chair in. I did you a real good deal on the box. Go on. -You see, I haven't primed him. I think it's only worth a fiver, that chair. -75 and then we're happy, aren't we? Steve, you deserve a kiss for that. Oh, lordy. Tim strikes a hard bargain. That's three items snapped up. making Tim's total spend £93.50. -Nice doing business with you. -Very good. We are very relaxed. How about you two? -Yeah, we had a great morning, haven't we? -Yeah, we've got the star purchase, haven't we? You've just got that overconfident look in you. -He used to be so likable. Things have never changed, have they? Clive and David are back in the car. Thankfully, it has brightened up. who beat me at golf. He's heading for a fall. So, we'll try to beat him, then, Clive, is that what you're...? I think there's no point in coming out in second place. Sounds like a man on a mission to me. -Yeah. That is a completely one-off in my life. I've never been involved in anything with quite that visibility. When I was chosen, the blogs were, "Who the... Who? a seemingly tranquil fishing port. victim to one of the worst British fishing disasters of all time. -Hi. Hello, hi! I'm Peter. Hello Peter. David. Nice to meet you. Thank you very much for coming. Welcome to Eyemouth Museum. In the 19th century, Eyemouth was a thriving fishing town. the whole community was involved in the industry. This was the booming fishing port in Scotland. to the Cornish inlets arriving at Eyemouth to make a living. the only fleet out that day. there was high prices because the market was empty of fish. So they became used to taking risks. They also had a reputation for being a rebellious, unruly bunch. People wouldn't go to church. People didn't get married so much. They didn't really care. Children were born out of wedlock. Why did that matter? Children didn't go to school. "on the boats? We don't want to do that." They're like rebels. It's a town of rebels. they were virtually tearing their hair out. the church dating back to the 1840s. earnings in something called the fish tithe. And over the next 20 years or so, a row erupted. At times, it was a violent row. Eventually, the Lord Advocate intervened. a one-off payment of £2,000 was issued. substantial government money, Eyemouth got nothing. to make it accessible at all tides were never implemented. see the original harbour wall. but it's what they had on October 14. So on that fatal day, where did it all go wrong? Everybody knew that there was a storm coming. One crew decided they wanted to go off. hit by one of the worst storms of the 19th century. The main boats had gone out roundabout 12, 12.15. The others were just making up there. when everything seemed to stop for a moment. And then suddenly, the hurricane broke with amazing rapidity. the sails were ripped to shreds within minutes. they were rocked and tossed about and the entire fleet was scattered. or head out to sea and enter the eye of the storm. For 19 boats, for 129 men, it was the wrong choice. destroyed on the rocks in full view of the men's families. And how long before the whole thing about who had died was resolved? -Was that weeks or days? -It did take several days. for a couple of days after and other parts of Yorkshire. it managed to sail home into Eyemouth Bay. were going to be disappointed except for one - his own wife. It was a terrible, terrible tragedy. and there were 263 children left without a father. how do you go forward with it? How has that taken on? footnote to this dreadful, dreadful thing. and how this community won through against all that adversity. levels of the community to recover. industry, and the town is once again a thriving hub. the picturesque town of Duns. This is your world, isn't it, this area? Is it a bit north for you? This is what I call God's allotment. Just finished. Oh, it's the best job. who's got a wealth of interesting wares on offer. -This came from a very, very old village just outside Duns. We just got it yesterday. Tim and Margie still have just over £300 left to spend. -Quite interesting. Because garden ornaments do sell. They do. As long as they are old. -But there's no price on it, is there? -No, there's no price on it. -It's just literally in. I was looking for £65 on it. -65 for a lump of rock? -But it's a carved lump of old rock! Old rock, 65 quid? No. Well, I was going to suggest 12 quid when I first saw it. -We'll have a powwow in the back. -Have you fallen out with us? Honestly, we are not in Benidorm now, Tim. -Yeah, for salmon fishing, probably. -Yes. With some good age to it as well. Is it? How old is it? Probably sort of around 1900.
fishermen across slippery surfaces and to check the water depth. You can also remove the end to put a landing net on it. Any names on it or anything that gives it anything special? No, but I think the top could possibly be Hardy. Has it got a price on it? That might see something like £18 on it. Last of the big spenders, aren't we? And you've got something here. That's a Hardy rod, yes. I know that things like this can be interesting. that has been around since the 19th century. The fishing rod is priced at £40, and the wading stick is 18. And there's also that stone birdbath, remember? So, what would be the absolute minimum on that? -I'm going to hit you with 30. -We'll carry on. We'll carry on. -I'll be happy with 30. -You'll be happy with 30, would you? -30 quid for a lump of rock. With a bird on it. And not the right type of bird. Tim is yet again focused on the deal. His method seems to be working. -Well, we bought one thing. So we're going to carry on, are we? Excuse me. Those are my sunglasses. -I thought they were mine. Sorry. -No, I just put them on there. Do you want your watch back? Honestly, you can't take him anywhere. What has Margie spotted now? We've got a horse's hoof. and make it into an ink well, which is quite common. -It's Edinburgh silver, and it's 1891. -Horsey people would go for that, wouldn't they? Usually they have the name of the horse or pony on it. -And with it being Edinburgh silver. -I've never seen anything like that. -We are going to Edinburgh, aren't we? -So, shall we get John back? Its ticket price is a hefty £125. John, are you... Are you free? But is John willing to do another discount? Do want to make an offer or do you want me...? Lordy, don't ask Tim that. Well, what can you give it us for...if I take that spike? It does seem like a lot of money to me. I was thinking about 70. -We'll take the lot. Thank you very much. -We got there in the end. That makes Tim's total spend £107.50. Cor! A new day has dawned, but has Clive finally mastered the left-hand drive? -Your own chauffeur in a classic car. -Only a few inches from the end of your life. I'm really looking forward to today. I'm assuming that you are feeling very confident after your buying. -Yeah. You've got that look. -Just on the edge of overconfidence. Well, we'll have to wait and see, won't we? I'm in good hands with David, though. Gosh, they're even competitive over whose expert is best. -Oh, he's lovely. He really is. He's lovely, and he's pretty good. -He's got this tough north, you know, Geordie bit. -Well, no, I was thinking £77.50. -You know, if it's 80 quid. -We've got two deals at £77.50. Clive is loving it, and Clive is lovely. Incredibly clever. And has a great sophistication. That comes out when he's looking at objects. an Edwardian double drop-arm sofa and a 1950s picnic box. -It reminds me of my childhood. Anything you see in Benidorm you say, "How much is that?" 30 quid for a lump of rock. and fishing rod with wading stick. I hear a Mustang. That is a Mustang. Oh, look at that. -Oh, look at these two. -There's no better, isn't it? the beautiful city of Edinburgh. Clive and David are travelling to the suburb of Newington. I've heard about Haggler Healy. He works in 50p. Hackler Healy inevitably has kind of spooked me. You're not the only one, Clive. so that's something to celebrate. Don't let Tim hear you say that. a traditional teahouse, which also specialises in antiques. Meeting them today is notre cher ami Cedric. -This is a very posh tea room. Clive's still got just under £300 left to spend. That people want to buy. so we need to be finding the extraordinarily different. You're doing very well as my big brother. I'm not sure 'big' is the correct word. -I don't want to lose. I mustn't show it. I don't want to lose. Don't tell anybody, but I don't want to lose either. Right? OK? Not that anyone has been particularly quiet about wanting to win. I spotted something that I quite like. I'll have to try. I'm going to quiz you here. What do you think they might be? -Does it hold something down? -No, it's a knife rest. -We've got a full set there. But I can just see the name on the box, which is very exciting. -French glass makers. Incredibly up-market. Very posh. and that will add to the value significantly. -I'm getting ridiculously excited about this. -Time to call on Cedric. We are very interested in these. I think they are very, very lovely. -What kind of price are you talking for this? -That's a big build-up, by the way. -That's it. You've done it. Clive, I think that was beautifully done. I would have given you 80, but I'm sorry about him. Honestly. -He's awful. I can't take him anywhere. There's still plenty more to uncover, cher Cedric. I've spotted this box here. "Well, that's just a boring old plain black box." -But to me, actually, I find that incredibly exciting. Very Sherlock Holmes, you know, from that kind of period. without any shadow of a doubt, is original. invented during the 19th century. have been reupholstered several times. it's in its original material. But you know what? Ruthlessly, it has to be cheap. Got to be 20, 30 quid. I told you you've got good taste. -Oh, yeah, I love it. -It actually used to be mine. I could do £100 for you. What do you think, Clive? Over to you. Well, at least Cedric is still laughing. -I said 20, he goes 40. Is that what you say in Leith then? Nae chance. That's right, very good! Nae chance. -Do we get everything that's in it? -It's getting worse and worse. -And everything else around it? Can you not make it 50? I'd like to do a deal at 50. Clive, good bit of negotiating. Yep, he's certainly getting better. and a cuddle from an incredibly charming Frenchman. -Pleasure doing business with you. Glad to see you again, Cedric. as part of the Parachute Regiment in the Territorial Army. and I hated every minute of it. And I got so bored that I joined the TA. And it gave me the confidence to throw the gear down at work one day. and said, "I'm going to be an actor." And of course, in those days, everybody thought you were mad. There weren't any working-class actors. Right. God, that is brilliant. and the area of Craiglockhart. of shell shock, an undiagnosed mental illness similar to PTSD. this should be of particular interest to Tim. -It's nice to see you. a sort of spa hotel. which is like a kind of a war...a war exhaustion, a war neurosis. and the injuries they inflicted, not just physically but also mentally. as it was called then? The symptoms were quite unique in some cases. paralysis sometimes of legs or arms. -So there was quite a variety of symptoms. Another fact of shell shock were nightmares and insomnia. At night, the men would pace the hallways, smoking. These were found up a chimney. back to the time of the war hospital. It's very typical of the men's reactions at night. Smoking was actually banned in the building, even then. shock increased, but it was still not classified as a serious illness. combat as soon as possible. As a result, hospitals like Craiglockhart were created. back on the front line? Well, at Craiglockhart, there were two distinctly different treatments. One was by Dr Brock. And his treatment was called ergo therapy. to things they would've been familiar with and comfortable with. teach at a school or help in an engineering work or help on a farm. specialised more in psychoanalysis and dream therapies. I suppose this was a very new thing at the time. So it must've been the very start of that then. Yes, I suppose it must have been. Another thing Dr Brock encouraged was creative writing. So, it was quite a professional publication, wasn't it? who are based in Edinburgh. Yeah, it was put together very professionally. of two very famous writers. Wilfred Owen, the great poet, edited six copies of the Hydra. -And Siegfried Sassoon was here at the same time. -Really? They made friends here. he wrote his statement against the war. It was read out in Parliament. his friend convinced the review board that Sassoon had shell shock. "I am a soldier convinced that I am acting on behalf of soldiers. "and liberation, has now become a war of aggression and conquest. "I believe..." This is a bit upsetting to read. and had been trapped for days next to the dead body of a fellow officer. and to communicate their feelings through their poetry. -written by him while he was actually at Craiglockhart. Let's have a read of it. Dolce et decorum est pro patria mori. It is sweet and meet to die for one's country. Wilfred Owen was sent back to the trenches. He died one week before the end of the war. and lived to a grand old age of 81.
the foundations for a more humane treatment of the mentally ill.
-Do you remember the old steam trains? Yeah, I grew up on steam trains. on the southern banks of the Firth of Forth. was built between 1883 and 1890. It has recently been named a UNESCO World Heritage Site. -I'm Clive, nice to meet you. Clive's still got £185 left to spend, but where to first? -Shall we go rummaging then? I'll go rummaging there, you go rummaging there. You are sending me packing, are you? All right, we'll rummage together. -All right, good, that's more like it. -Do you want to go first? They're like a comedy double act, these two. We are not really on a nautical theme, are we? No, we weren't thinking of being nautical. We could be nautical but nice. -I thought that was really good. Let's scrap that double act idea, shall we? Is there a market for these kind of things, like bits of boats? Yeah, yeah, bits of boats are good news, I've got to say. -What about that thing there? I mean, feel the weight of that. -And it's worn as well. Bits knocked off it. It is a functioning thing. Look at the way it is constructed, that is not a mass-produced thing. Look, it's so... It's almost raw, isn't it? a nautical-themed item could be a good bet. It rings like a bell, doesn't it? He is getting excited here, Jenny, I can sense it. This is a worrying situation. This is very worrying. Clive's been drawn in hook, line and sinker. But is Jenny willing to do a deal? Let's be honest, that was chucked away. I could let that go for 30. I think that will give you a chance. -What would that go as an estimate at auction? I think at 20 quid-ish would be good. And there's a possibility of a profit. But what do you feel? -Ish is sounding good, yeah. As always, Clive is quick to accept a deal. Lovely, thank you very much. Now, Tim would've asked to have the boat thrown in for free too. Ha! Tim and Margie are still in Edinburgh, and in Newington. They're visiting Courtyard Antiques, a real treasure trove. -Look at the stuff in here. -That is the size of a real one, isn't it? Tim's got £199 left to spend. -Trying to win. Trying to beat that David and Clive team. Does Lewis have anything to add to their previous purchases? You could use that for tying flies. -..grips here and then wrap them through. Normally, I would ask £25 for that. -But you could have it for ten. That could go with our wading stick. It certainly is a possibility. But there is more to scout. -I'd like to go upstairs, if possible. OK. You seem at home around here. -It's a good in here, isn't it? With such a variety, perhaps a guiding hand is needed here. -I know what we can look at - fishing scales. Well, how much is a little trifle like that? -Have we got you with that? -I thought you were going to say 20. -That would have actually made sense. -I'm keeping out of this. -I'm keeping shtum. This is your deal. -17, and you got a deal. Look out, Lewis, he is moving in for a handshake. -He doesn't mess about, does he? -No, a man of few words. -We've got a lot to win now. Tim adds this to his lot of fishing rod and wading stick. And with that, their shopping is complete. Time to catch up with the other team and reveal all their wares. DAVID: Well, how are you two feeling? Haggler Healy is what I'm nervous about. -There's quite a lot to reveal. -Oh, dear, I could never sell those. What do you mean you could never sell those? I've always had trouble selling those. Because you're rubbish at selling things? -Yes. Then we've got a propeller. -And is this part of the hotel or...? -Effectively, it is a duet stool. A piano stool. Well, we don't all have huge bottoms. It is a very good maker, and it is in its original fabric. -My gosh, that's a heavy birdbath! -Yeah, it is, and it is from an estate. -You've left price tag on. -Right, we did a little fishing... We did a parcel. -Right, and that is for tying your flies. -That is for tying your flies. -Yes, this is good. For a horse's foot. Hoof. -What did you pay for that? -Well, that is going to double its money. -We've got a lovely pair of plaid. -Yeah, yeah. See, are you nervous now? -No, this is the Coronation Chair. It's a six...a sixpenny bank. -We'll see you at the auction. There are two very different sets of things to be sold. I think it is even-stevens. I was impressed with their stuff. I've got to say, I was as well. -..we could have the edge. -Would you swap any of ours for any of theirs? -No. No, I'm not going there. -Me neither. So we are still confident. -And I really enjoyed it. -And I'll see you at the auction. an area famously home to the five-star Royal Yacht Britannia. And today, the boys are having a shot in the Jensen. Really, I am really excited about it. Are you? -I am quite nervous, to be honest. but I've really no idea. -I am a bit worried about me...the rock. -It's just a piece of rock. -With a bird stuck on the top. the idea that the things come down. It is going to be quite interesting. -it could get a little bit... What's the word? You're looking remarkably chipper and confident. -No, I think we're going to have a good day. -I do as well, actually. I think I might win. David, how are you? Good to see you. -Margie, David's got your slacks on. -He loves his coloured slacks. They are blue, aren't they? our celebs' antiques are for sale online, on the phone and in the room. Wielding the gavel, or rather Biro, today is Martin Cornish. The one item I am not so keen on is the Brexton picnic case. so it is something that is not so popular. high prices are the two plaid brooches. They are in beautiful condition. they are something that will sell really well. They spent a total of £218. all of which he loved. It looks like a piece of artwork. It would look very nice in a garden! 50 to start it, quickly. -'100. Your bid in the back." -That is a bad start for us. -Thank you so much, Mother! What an incredible start to today's auction. Next up is Clive's nostalgic 1950s picnic set. £20, I'm bid for the Brexton picnic case. That is a loss after auction costs. the mahogany box and miniature Coronation throne. 30 for the two. 20 for them. 45 in the very back. 'A very good start. Well done. £40 I'm bid for this. 80. £80 on the internet. Against you at 85... No other offers, now at 85. -Well done, Tim. Well done, Margie. -I thought it'd do better than that. No, that's good. Good profit. That's a good margin. 'Absolutely brilliant, I'd say. Another great profit. 60. Five. 70. Five. 80. Five. And ten. 120. 130. 140. -That is a blow, isn't it? but great news for Clive as he has more than tripled his money. Now it is Clive's crystal knife rests. 30 for them. To start them. 30. It'll add a bit of glamour to your dining table. 30. 20 to start them. For the knife rests, at 45. Unusual lot, you sure you don't want to have another shot? Last call. At 45. 50. On the right, standing, at 65. -One more would be nice! -Go on, you know you want them. -You nearly made a loss there. -How much did you pay for them? Competition is getting rather fierce. So far, Tim has been rather quiet. But will his bargain basement silver brooches brighten him up? And I can start the bidding at £100. -There you go. You're away. They look fantastic with a kilt! And I'm selling them. Duff 150. Very, very, very good. Well done. -You can relax now. Oh, you are relaxed. another item that's more than doubled its money. Tim's next item was a bit of a gamble. It's his Victorian hoof inkwell with silver top. What shall we start the bidding at? £80 to get it going. 80 I'm bid. 90. 95. 100. And ten. -They're paying a lot of money for it. Go on, say it. It's trotting off or something. Go on. And worth it, well done. Tim. -Tim has perked up with that. -Look at him now, he's come alive now. and pushed him into the lead. Will his Victorian birdbath help maintain the winning streak? 50 to start it. 50 I'm bid. -Paid more than that for it. Last call, and I'm selling it at 100. -How are you feeling, big fella? -I'm feeling like... That was wrong. At every level, that was wrong. At £70. For the sofa. -Of all the things, of all the things. -I feel disappointed for you. Gosh, what a shame. Clive loved that sofa. But who has come out on top? It has been a competitive Road Trip with both teams starting with £400. Well done, chaps. All profits go, of course, to Children in Need. That's phenomenal. That really is phenomenal. I've no idea, but you're brilliant. You are brilliant. -Can I get a kiss too if I bend down? -I've loved every minute of it. -It's been a delight, Clive. -Thank you so much. Thank you very much. -7-litre motor, here we go. -Well, that was just fantastic. I really enjoyed it. So did I, all week. It has been a laugh, a gas. -It has been a laugh, it's been... It's been a surprise. -Something different. More lines to learn. -And meeting you again after all this time. Well done, both. Or should I say... Auf Wiedersehen, pets! 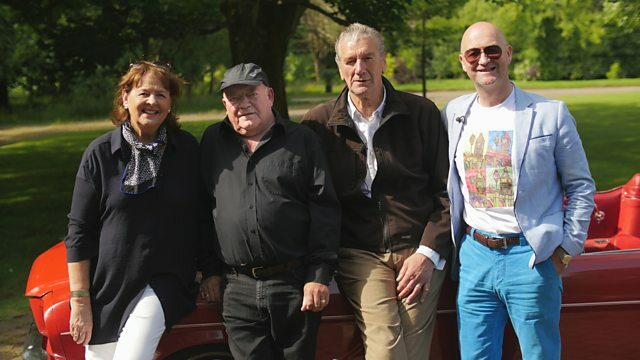 Two titans of British acting hit the road today as Game of Thrones star Clive Russell takes on Auf Wiedersehen, Pet and Benidorm star Tim Healy in an antiques battle. They shop around Berwickshire and West Lothian before a thrilling auction in Edinburgh.